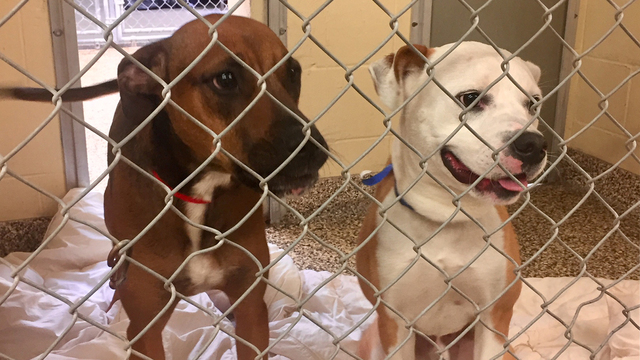 HILLSBOROUGH COUNTY, Fla. (WFLA) - Hillsborough County’s Pet Resource Center is waiving adoption fees this weekend, giving many dogs a better chance at finding a home. The shelter, which is located at 440 N. Falkenburg Road, has seen an increase in dogs brought to its doors and has been at or near capacity for several weeks. On Thursday, the shelter was at 112 percent capacity with 276 dogs. The shelter is waiving adoption fees on all "ready-to-go" dogs an effort to lower the stubbornly high population of dogs" at the shelter, a news release states. The special starts on Friday and lasts until Sunday. The Pet Resource Center is open from 10 a.m. to 7 p.m.
Click here to view adoptable pets at the shelter. Many are still trying to get home.